1. Added 2 new checkpoints for more credible visibility checks. 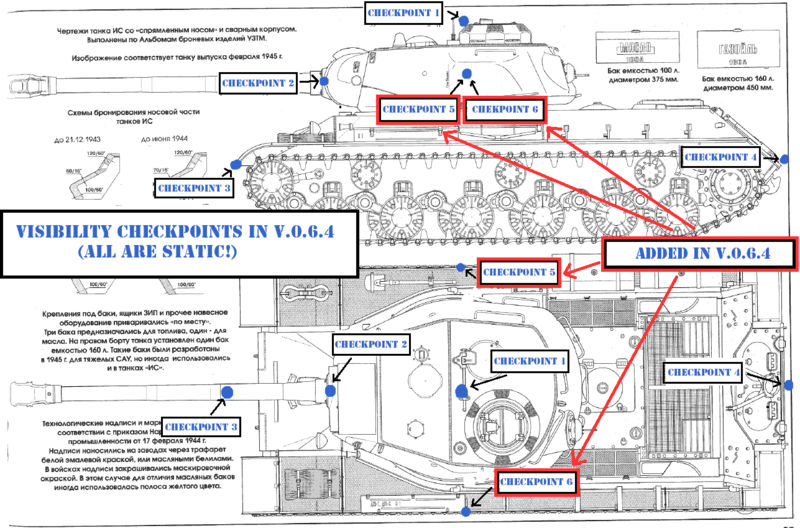 These checkpoints are located on each side of the turret (see the drawing - Checkpoints 5 and 6). 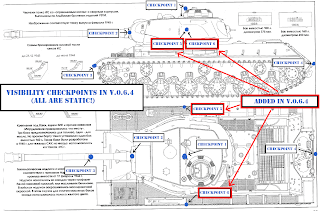 If the ray that goes from view range port to a visiblility checkpoint freely (terrain, objects), taking into account camouflage value of your tank, view range of the enemy tank, bushes effect, your tank is spotted by the enemy. 2. A dynamic view range port was added to the place where gun joins turret. It changes its location during turret traverse. In general it works as static view range port. The two view range ports take turns, e.g. for 445 radius: at first works the port on commander's coppula, 2 sec later - the one on the gun, then - on the coppula, etc. 3. When the vehicle is firing it loses camouflage bonus from all bushes within 15m radius, barring the one that has the greatest invisibility coefficient. 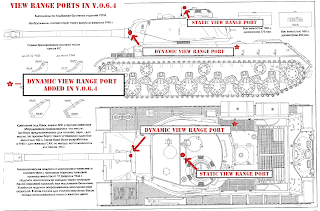 This applies to each ray that goes from view range port to a visiblility checkpoint of the firing vehicle. "within 445 m range (maximum indirect visibility range) - every 2.0 sec"
Does this mean that game has a built in view range cap at 445 meters (althou the game clearly states that it is 500 meters)? Is that 15m from each checkpoint? I have two griefs with the old spotting system. Are you satisfied with how the changes improve the accuracy problems of the visibility mechanics? Q: Does this mean that game has a built in view range cap at 445 meters (althou the game clearly states that it is 500 meters)? A: No, 445m is an actual limitation we have in practice, tanking into account minimal camo values and no binos installed. Q: Are you satisfied with how the changes improve the accuracy problems of the visibility mechanics? A: Might be not perfect, but improvement is noticeable. Does this actually mean no more IS3 is passing by at less than 150m and stays invisible while moving? That was actually for me the biggest weaknest of the game. A tank that is moving should be always stay visible, aknowledging the 500m view range restriction by game engine, at min 300m on open areas. I'm not talkin about a tank moving in the woods or stationary. What really bugs me is invisible tanks that are moving. Overlord could you please clear something up for me. In the game there is the view range for spotting enemy tanks yourself,then there is another nameless value, ill call it the view by radio range that allows you to see tanks your teammates have spotted and radioed to you. What determines the view by radio range as I know i've shot things over 520m away. Also the binoculars affect both? Or just the view range? Also thank you for taking the time to fix and also add some explanation to how exactly spotting works. To clarify the view by radio range in my above statement, I'm talking about being able to see and actually aim at people in the video game engine, not them merely showing up on the minimap. This looks like a step in the right direction. What's missing though is a way to handle a tank or TD which is in cover, but the muzzle of its gun is exposed. An additional viewpoint should be added which if the check passes will display the model of the muzzle protruding from the bush. When firing the visibility of this point increases and if that check passes then a muzzle blast is displayed. Along with this any bushes in the cone of the muzzle blast should react accordingly. After X seconds the visibility of the muzzle returns to its normal value. This would be more realistic than the all-or-nothing visibility model detailed above. Q: What determines the view by radio range as I know i've shot things over 520m away. A: You can see targets spotted by your allies. Your radio ranges are summed up. Q: Also the binoculars affect both? Or just the view range? A: Only view range ofc. Overlord is there a chance to get your feedback vom RU servers. Maybe an EU release date or something ? Will there also be changes on values for some tanks ? 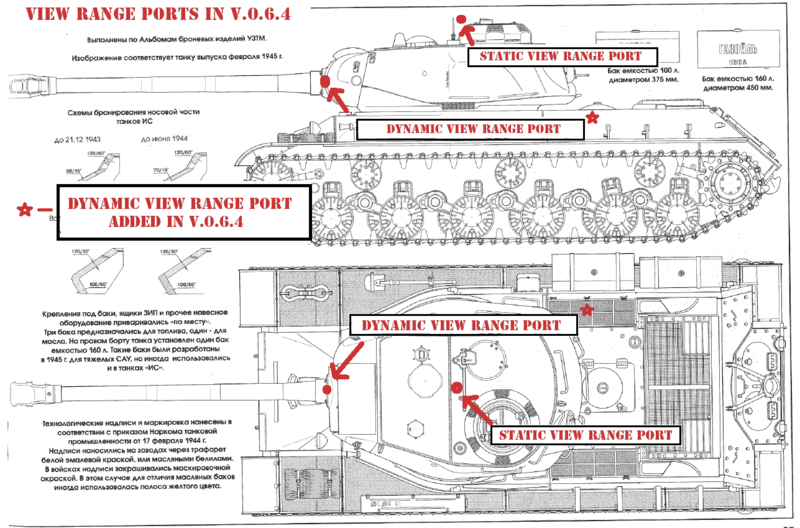 I´d be really interested if Jp4 and Stug3 will still be ghosts. Most annoying thing to everyone is invisible tanks shooting you. Invisible tanks moving ok. But after they fired at you, and hit, they should become visible. - at least when they are in ur view range! "But after they fired at you, and hit, they should become visible." Except that irl this was not the case. Nothing irl says that just because a shot is fired that the firer can be seen. The game has the equivalent of muzzle blast with the 'tracer trail' shots leave - much more than irl and a visual pointer to where the shot came from! The lag in sighting because of processing time for sighting checks is absolutely valid - hopefully the coders can improve this (though it'll never be as intant as it should be compared to rl). The idea that "if it shoots I should see it" is completely bogus. i have one Q.... when??? Q: i have one Q.... when??? For the removing all but one bush for camo when firing part. Does this mean that you get one bush or one bush per enemy / visibility ray? ie If I have bushes to the front and side, and enemies to the front and side, will one of them definately see me since the bush on their side has been removed for camo? I think this view system is going to continue to be a source of problems for this game, and is one of the major contributing factors in why battles are so slow. Its very annoying when I enter a seemingly empty field only to find that there's a platoon of heavy tanks right in the center that were just out of my viewing range. I feel like I'm punished for trying to lead an attack... I think something needs to be done about tanks that are in no cover what so ever. Have the camo values of Jagdpanther been fixed, too? They are broken in 0.6.3.11? Q: Have the camo values of Jagdpanther been fixed, too? They are broken in 0.6.3.11? A: Camo values for all vehicles have been reconsidered, including JP. I agree that it is perfectly realistic and desired, that a shooter might stay concealed even after firing (nicely camouflaged TD for example). But I rather have these situations in mind when a heavy is being spotted in the flat open by a scout, even shooting and driving around. In that situation I am able to shoot him as long as the scouts lives - but let the scout die, and *frizzle* the heavy tank switches on his romulan/klingon invisibility cloaking device and is gone again. I (and a lot people that I play with) do not like this feature, because it should be like (1) scout make me aware of target, then (2) I make visual contact myself and can continue to fight this target, even if the scout dies. Without my own visual contact I would not be able to fire at all, and the dead of the scout should not make the tank suddenly invisble. And about that team-play argument: I would be perfectly happy to split the exp. with the scout even if I damage the tank after he spotted for me. World of Tanks and Steam?